CAUTION:The identification of these plants is by the owner of the linked site. If I become aware of a questionable identity, I attach a comment following that link. The purpose of this web site is simply to assist you in finding photos. I do not vouch for their true identity. 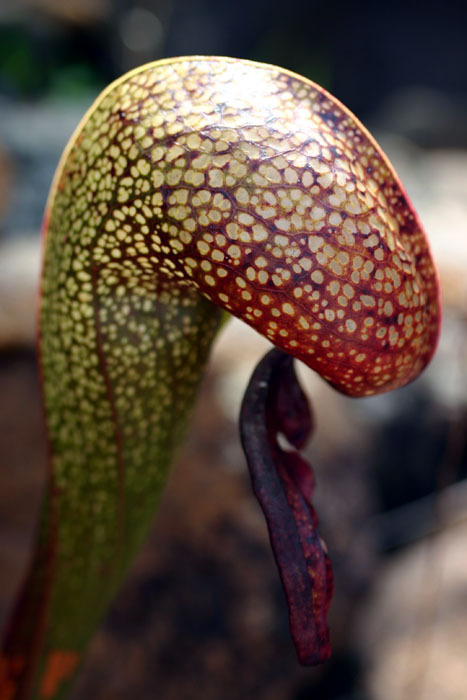 The taxonomy follows that used by Jan Schlauer in the Carnivorous Plant Names Database. The identity of the plant is the responsibility of the owner of the photo. Although the convention for naming hybrids is to list female parent first, the order of listing parents is unfortunately not consistent among growers. For example, the hybrid Nepenthes x [alata x maxima] may or may not be the same breeding as the hybrid listed Nepenthes x [maxima x alata]. For over 50 years I have been interested in carnivorous plants and often wondered what a particular species looks like. The Internet is a wonderful tool, but sometimes finding a particular item requires wading through lots of irrelevant files. 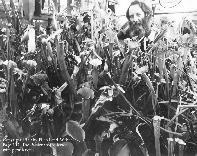 So, I began collecting links to photos of carnivorous plants that I encountered. Many of the photos are copyrighted by the owner and I strongly suggest that you contact the owners of the photographs before reproducing them elsewhere. Often there are additional photos and descriptions at a particular web site. I encourage you to visit the owner's web pages for a more complete understanding of each photograph. If you are aware of a photo of a species that is missing, or a better photo than those listed, please let me know. Also, if a plant is clearly misidentified, let the owner know, with a cc to me. I will add a note to the list stating that the identity is possibly incorrect (see for example, Nepenthes anamensis or Pinguicula 'Weser'). The web is extremely dynamic. Links appear and disappear every day. I remove broken links as I find them, but some sneak by. I realize that there is a problem accessing some of the links. For example, direct links to jpg files occasionally fail, not because my URL is not valid, but because these ISPs block links that go directly to a file or they limit traffic. The way around it is to go to the orginator's homepage and navigate from there. Another trick that sometimes works is to copy the link and paste it in your browser address window. Also, some sites use non-standard html coding for their links that is not recognized by some older browsers. In such case, try a newer version of the browser which is more permissive of coding irregularities. Finally, some sites restrict viewing to registered members. These web pages were designed and coded by the fantastically skilled Jan Myszkier. If you discover any problems, please let me know and we will attempt to fix them. There is also ongoing page translation project, if you would like to help us translate the site to your own language, let us know!